Published on 13 April 2011. I am a Sky News viewer. That’s my guilty confession. I don’t so much sit and watch it as have it on in the background when I’m at home. It’s essentially moving wallpaper for my living room, often ‘watched’ without sound. I choose Sky News because it’s the least distracting of the news channels. That used to be true of BBC News 24, but there’s something about the presentational style now that distracts me. I don’t know what it is, or whether that’s a good thing for attracting viewers who actually want to watch, but it’s turned me off. I also like the fact that they respond and change scripts when I send them moany emails pointing out the factual errors in their medical reportage, whereas the BBC generally ignore me. 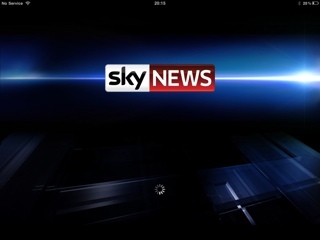 So, as a Sky News viewer, the iPad App has been marketed very heavily at me. Frankly, I’m fed up of seeing the adverts. The app is fairly new, and has received a lot of praise from all over the place: Tech Radar basically loved it, Zath thought it was one of the iPad’s best apps, and Crowded Brain gave it 9/10. The app is often praised for its innovative presentational style and ‘immersive’ experience. It has two main gateways, both of which are video focussed. There is a traditional ‘order of importance’ approach, where videos and headlines from stories are dynamically (read: messily) arranged with size and position indicating importance. Hit a video and it starts to play, while contextual information flies in from the sides. The contextual information is generally more video content on the same story, textual content, or interactive graphics. Alternatively, the ‘timeline’ view gives me a virtually minute-by-minute index of what has been presented on Sky News over the last 24 hours, and allows me to jump to any bit of it, with the contextual fly-ins as above. I really do very strongly dislike this app. I just don’t think I’m a person who enjoys consuming news through video. I might have Sky News on all the time, but I guess I don’t really watch it. Save for some recent very big stories, few newsworthy items lend themselves to videos – moving pictures rarely add all that much to understanding. I’d far rather scan-read a written article than spend three times the time being spoon-fed a simplified version of the issue via video. I didn’t realise how strongly I felt about this until this app came along. I rarely click the videos in online news articles, but they don’t bother me – I just ignore them. But when you go down this Sky News route of removing almost everything but the video it becomes painfully clear that this isn’t the way I like to consume my news. I’ll concede that the app is visually striking – though I wouldn’t necessarily call it attractive. I’ll concede that it’s innovative – I’ve never seen anything quite like it before. But I’ll conclude that it’s not for me – when it moves to a subscription model, I won’t be paying. This is the third in a series of posts reviewing iPad Apps. Yesterday’s review was of the iWork Apps. Check back tomorrow for my review of Who Wants to be a Millionaire HD. Yes, really. This 1,433rd post was filed under: iPad App Reviews, Media, Reviews, Technology, Apple, iPad, Sky News. Trackback received at 12:01 on 14th April 2011.